3D scanning has been around for years, but it's traditionally required the use of a clunky device. Today, a Bay Area startup has unveiled a tiny alternative: The Structure Scanner, a diminutive 3D scanner that hooks right into your iPad, allowing you to capture 3D information about the world around you. The device—which launches today on Kickstarter—is the brainchild of Bay Area startup Occipital, which has traditionally dealt with computer vision. This was the company's first piece of hardware, so the team enlisted the product design expertise of New Deal Design, the studio behind Lytro and FitBit. Together, they created a tiny anodized aluminum device that pops onto your iPad in a snap, making it possible to use the camera to capture 3D information in real time. Traditionally, there have been two markets for 3D scanners—on the one hand, you have designers and architects who use the clunkier versions to capture information about objects and buildings, and on the other, gamers who use the devices like a Kinect, as an interface with a game environment. Structure Sensor is designed to bridge that gap. It's powerful enough to capture precise real-world information, but sensitive enough that you can use it to play augmented reality games using your iPad. "We wanted to start working [on] an augmented reality game engine that finally delivered a seamless blend of virtual objects and the physical world," the designers explain. "But there was a problem. We had reached a limit with the existing sensors in our mobile devices. Instead of waiting for someone else to create that sensor, we turned ourselves into a hardware company to create the Structure Sensor." 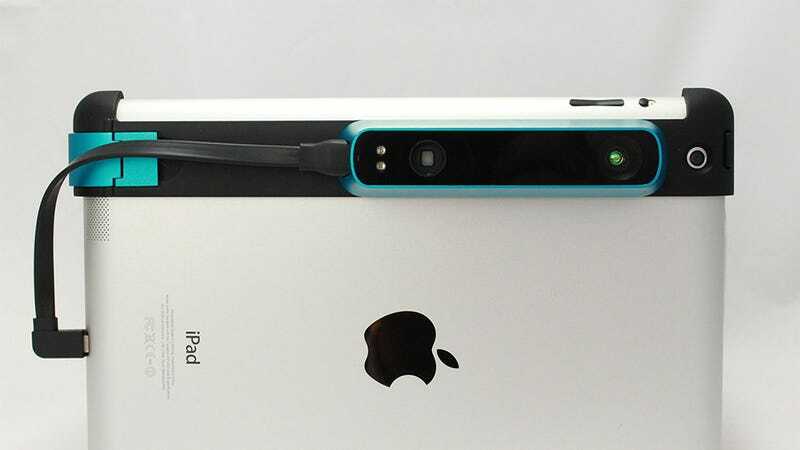 As such, Occipital will be releasing an SDK with the device that will allow developers to leverage the first 3D sensor in iOS, too—so expect to see plenty of apps when the device ships next year. Gizmodo had a chance to test the prototype device this spring, when the team from Occipital stopped by the office to chat. In person, it's remarkably fast and smooth. You snap it onto your device and open up the UI, which shows you the world through the camera. Powered by your iPad's lightning connector, its dual infrared LEDs capture information about the room (and people!) while the UI shows you what you're grabbing through the iPad's camera UI. So even if you've never used a 3D scanner, using the sensor is as easy as snapping a photo. You can explore your 3D model on screen, or download it to manipulate on your computer.